You’re coming with me, friend! Welcome to March! …nervous laughter… To make up for my delay in getting to March, I’m going to start my posts for this issue off with an amazing recipe that you’ll want to try as soon as possible. This is a bookmark it, pin it, print it, laminate it, share it, love it recipe. I promise. It’s so good that when faced with the idea of leaving some of it behind for a weekend trip to my parents’ house or bringing it with, we packed it. J ate this stuff like it was his job. A few notes about the recipe. First, this is one of those times that an oval slow-cooker really comes in handy. When is the other time? Um, the Consumer Reports thing I read about slow-cookers said they are good for giant roasts. I’m not sure I’ve ever made a roast in the slow-cooker that was so big that I couldn’t have gotten away with a round one, but I’ll give it to them. 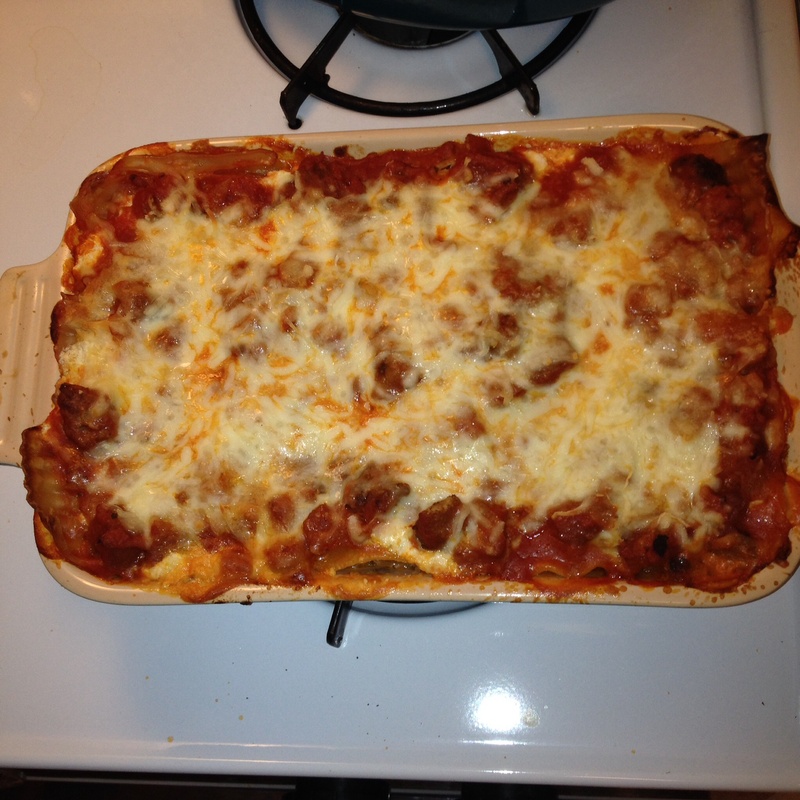 What they should have said in the article was that oval slow-cookers are good for making lasagna. The magazine has a picture of all of these little broken shards of lasagna noodle stacked on top of each other looking haphazard at best. It says “To fit lasagna noodles into a round slow cooker, break of corners as needed.” For an oval slow cooker, that meant busting maybe a couple noodles here and there. Second, this recipe is bland as written. Even with the Italian sausage. 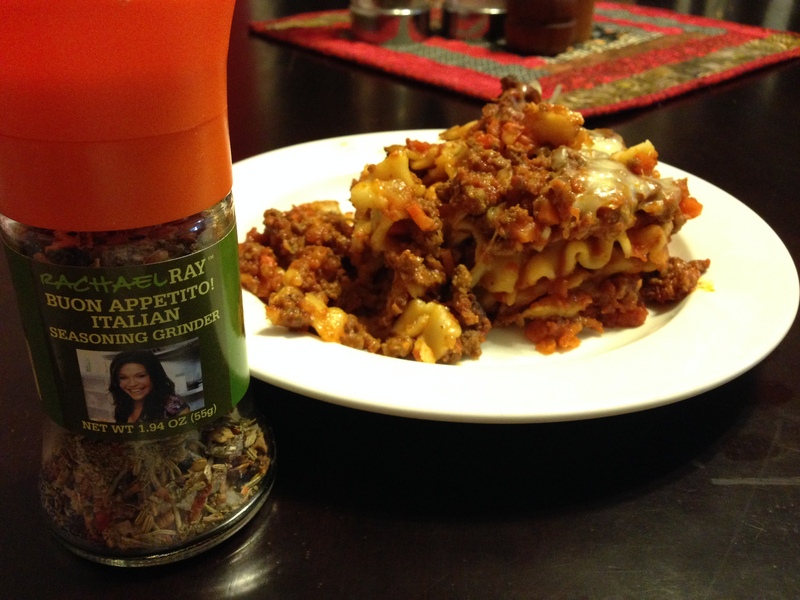 What you see pictured with the lasagna below is the jar of Rachael Ray italian seasoning that I ground very liberaly on to my lasagna. It needed something. If you make this recipe, excuse me, WHEN you make this recipe, add a couple teaspoons or two of Italian seasoning or just a mix of your favorite Italian dried herbs. I’m a fennel seed fanatic myself. eggplant and basil in the dead of winter. decadent! It has kind of a birth of Venus thing going on, doesn’t it? So many stir fries in this issue. If you add up the stir fry feature with the winter green sautees, that’s a whole lot of warm veggie glop on top of rice, pasta, or something. These three are quite representative of all of the stir frying going on in issue #69 in that they are all ok, but not great, and all low calorie (until you start adding noodles and such…). The Shrimp and Scallion Stir Fry can literally be summed up just by reading the name of the recipe. 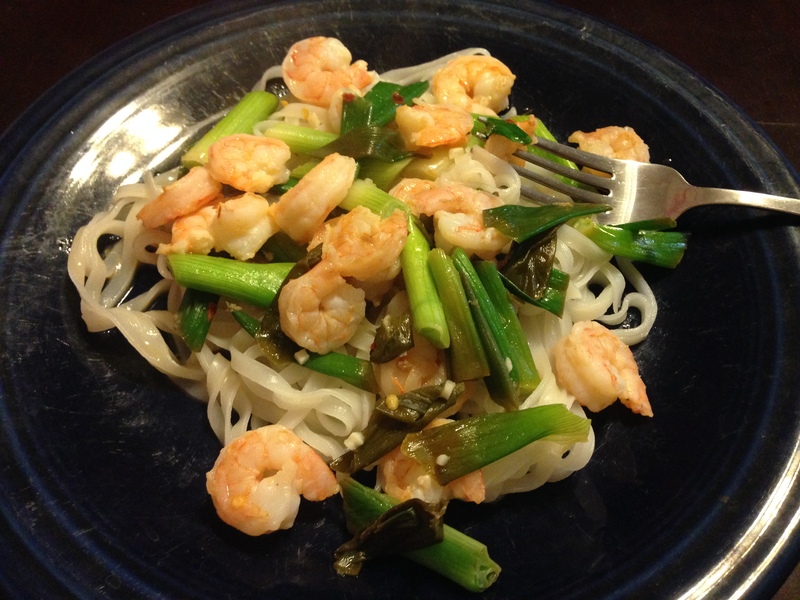 See, there’s some shrimp and some scallions and you stir fry them. Still with me? Oh, and there’s garlic. 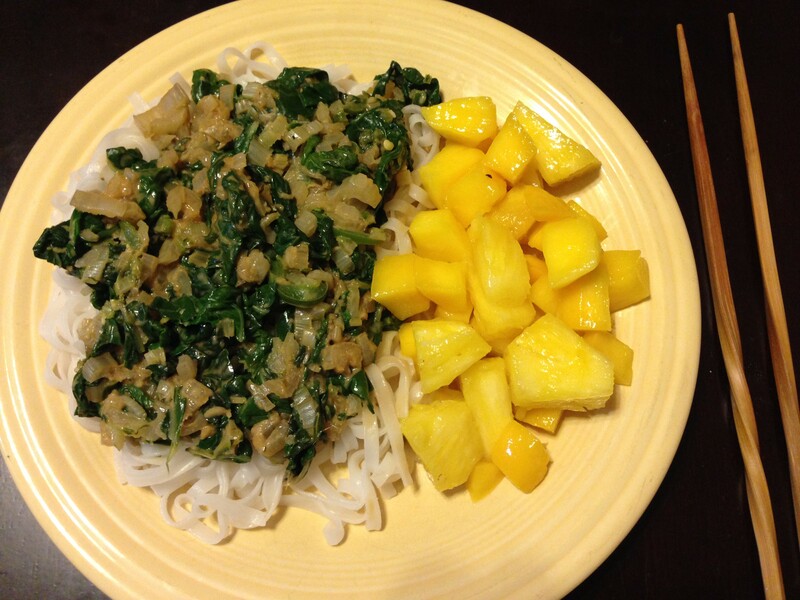 I served it over rice noodles because I’m still trying to get rid of those suckers. 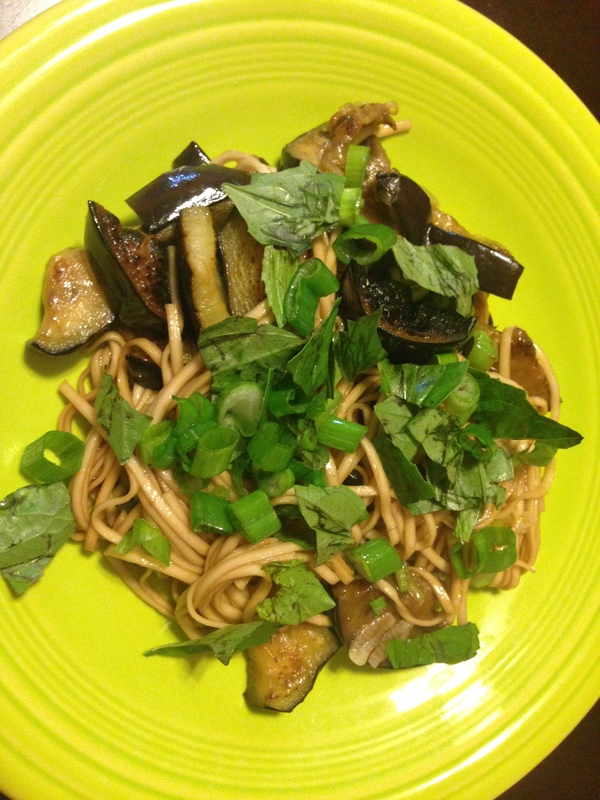 The Stir-fried noodles with eggplant and basil was very good, if somewhat impractical. I like to try and cook seasonally and Everyday Food usually supports that. They’ve got a whole “in season” section and everything. But then they have a chicken sandwich with zucchini on it and a stir fry with eggplant and basil in this issue. Oh, and the chicken salad with basil too. On one hand, I can’t complain. It is definitely awesome to taste basil in the dead of winter. It almost makes me believe that summer is coming, which it obviously isn’t. It’s currently 28 degrees outside and it’s March 23rd. There just won’t be an end to winter. So buy some basil! The Stir-fried turkey in lettuce wraps was good, but I still don’t care for lettuce wraps as a concept for the same reason that I don’t like hard shell tacos, too messy. I know. I know. Polly Prissy Pants over here. Also, when you make lettuce wraps, you have to spend so much time delicately removing each lettuce leaf carefully, carefully, so carefully….dang it! It tore! Then what do you do? 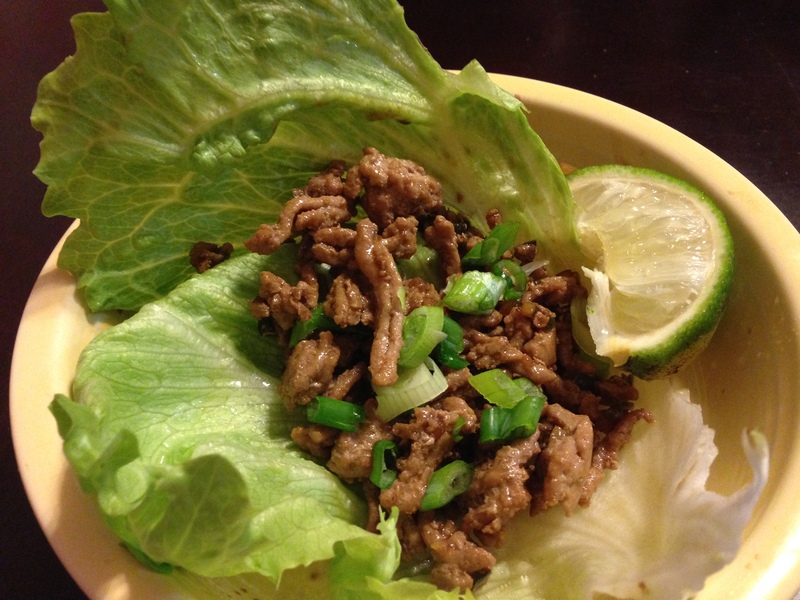 Make a very tiny lettuce wrap? Give up and start over? These are serious questions folks. So the flavor of this recipe is quite good, but it’s not good enough to make me like lettuce wraps. Oh, and yeah, that’s iceberg lettuce. I know I’d get better results with a fancier lettuce, but I’d be angrier when the leaves tear because of the extra money. So…kind of a catch 22. In conclusion, if you need a stir fry, go to your EF collection and grab #69. Whew! Thank Goodness for the January/February Issue! You may have noticed, we fell a little behind on the writing again. Ugh. Who knew so much writing would be required for a blog? Anyway, as usual, we have been cooking in a timely manner, just not updating you on all of our adventures. So, let me introduce the Jan/Feb 2010 issue! The Light Issue. Lots of lean meats and veggies in this one. 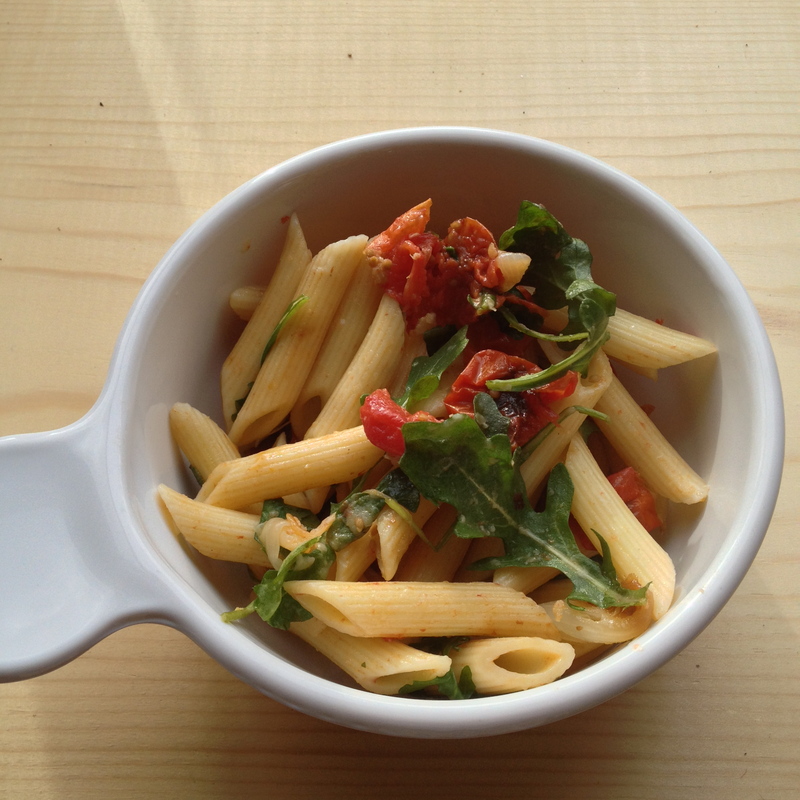 I started the year off making the Pasta with Roasted Vegetables and Arugula. As is often the case with the EF pastas, it seemed a little dry. I don’t think this would have been an issue if I had doubled the roasted vegetable recipe. The vegetables were pretty delicious. Roasted garlic, shallot and tomato make a nice, savory combination. I say, go ahead and make this, just double the veg! Sigh. Here we have yet one more Everyday Food recipe for pasta with no sauce. It’s not offensive. It’s just not terribly interesting. 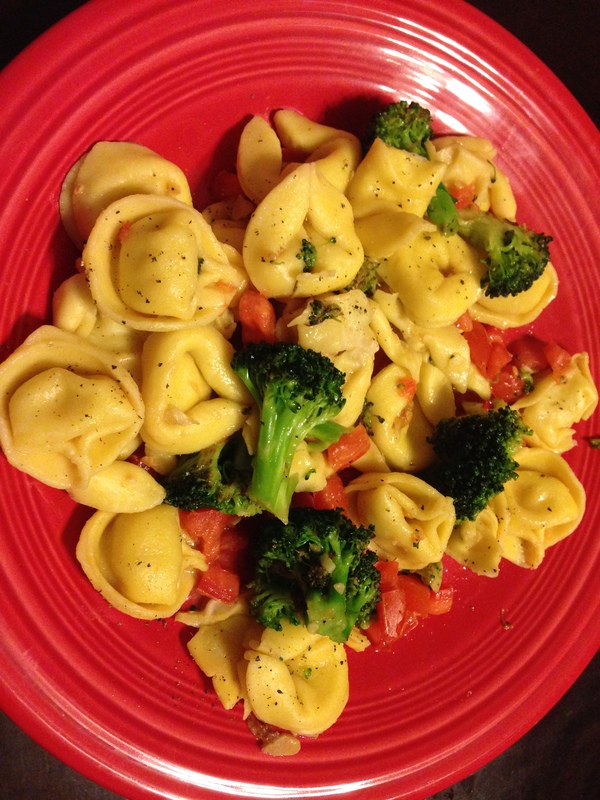 It’s just cheese tortellini with tomato bits, broccoli, and a little garlic action. But what it lacks in interest, it makes up for in being super easy to make. Sauté the garlic and the broccoli in the butter. Boil the tortellini. Toss the pasta with the garlic, broccoli, and tomatoes. Something about reserved pasta water (over it). 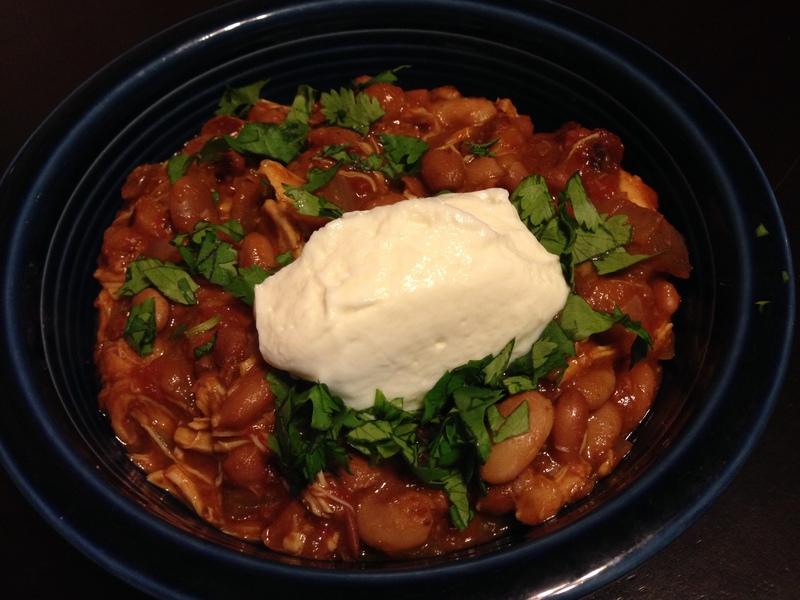 Tex mex chicken and beans is your classic Pinterest slow cooker dump recipe. There’s very little prep. I didn’t have bell pepper and I’ve had bell peppers get weird in a slow cooker, so I put in the other 1/2 of a 28 oz can of whole tomatoes, cut up with scissors. Those were from the huevos rancheros recipe in October. Plus, my chipotles in adobo came from the freezer. You never use a whole can, so I freeze the peppers with adobe in ice cube trays, one pepper per whole, lined with plastic wrap. Once they are frozen, you can just slide them out wrap and all and put them in a freezer bag. It takes maybe 2 minutes on defrost to bring them back to life. I also added some more dried pinto beans because I was scared that the stuff wasn’t reaching halfway up the side of the crock, and the instructions on the crockpot are pretty explicit about that. Other than that, it was just a matter of letting it heat up. Super easy. Very very good. 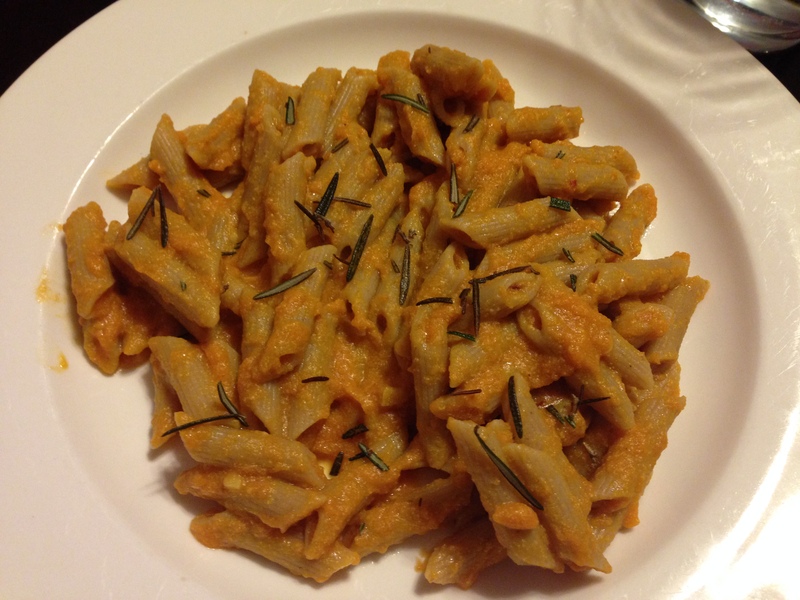 The penne with pumpkin sauce recipe hits the other Pinterest high note: pumpkin. But it does it in a more sophisticated way. It’s not cloying and sweet. The white wine vinegar cuts a lot of the sweetness. I will say that you should believe the recipe when it says to salt it generously, the canned pumpkin needs salt. Also, frying rosemary is a total mess, and it is stressful trying to pick little pieces out of hot oil with a slotted spoon. Luckily, it adds some flavor and crunch along with the stress. I made a separate serving for J without the rosemary and red pepper flakes. He liked it well enough. So I haven’t really mentioned this before, but I’m not a beef eater. When I was in 8th grade, I thought cows were pretty awesome (I also thought they tasted awesome at the time). Since I thought they were adorable, I started to feel bad about eating them. I then started to feel bad about eating pigs and chickens too, so I was full on vegetarian for a while. (My love of bacon ended that one…). Anyway, after I started eating bacon, and ham, and pork chops, I also started eating chicken again. Somehow, I held out on the beef for years. Now, I have tried to add it back in but now I can’t stand the taste. The pure beefy-ness is too much. I’m going to continue my attempts to add it back in, but I’m not sure I’ll ever really love it again. Needless to say, I did not make this with beef. I made it with turkey. It was quite tasty. I also think you could very easily make this without any meat by replacing the ground meat with nice meaty cremini mushrooms. 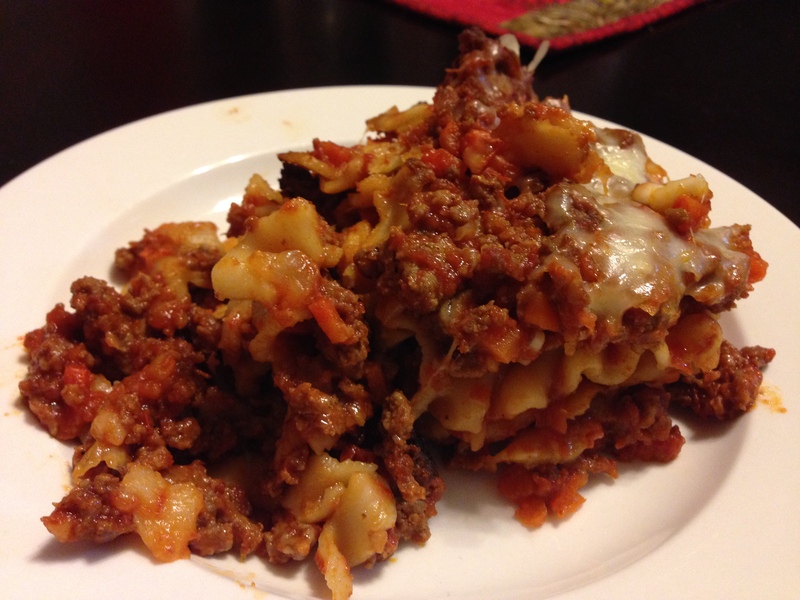 One thing that may be a little unrealistic about the recipe is the call for whole wheat lasagna noodles. I had to search three different stores, (including a health food store!) and ended up buying something that claimed to be a lower carb noodle which I took to mean had more whole grains. I don’t know if the search for the right noodles was really worth it. Isn’t the turkey and eggplant enough? All in all, it did taste really good. I think I need to end this post so I can go warm it up for lunch! canned beets to the rescue! This is a delicious recipe. If you like blue cheese and you’re even on the fence about beets, then this is a good one. I’d also like to add that this is one of the first foods we fed J after we switched over from feeding him “baby” food to just giving him whatever we eat in smaller pieces with less seasoning. He liked it! Best. Baby. Ever. One quick note about the beets: This recipe has you roasting your own. That takes forever. Unless you have a garden or there was an amazing sale on beets, just do yourself a favor and buy canned ones. 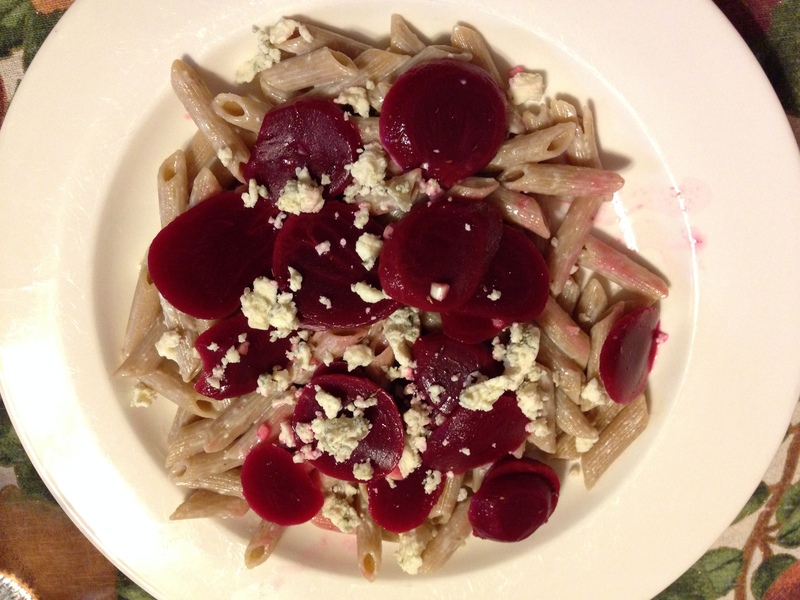 Here’s how forgiving this recipe is, it says you can use canned whole beets. I used canned sliced beets from Aldi (I need a keyboard shortcut for how often I type “Aldi”), and it was 100% fine. No, canned beets do not have the freshness or depth of flavor that roasted ones do. But if it’s between no beets and canned beets…advantage canned. I’ve got to say right off the bat how hilarious and fitting it is that I got a picture of both of these in their leftover containers. They were so forgettable that I didn’t even remember to take a picture. Well, I had company over for the first one, so I was a little distracted. But still. Those pictures sum this up quite nicely. I didn’t even plan it like that. 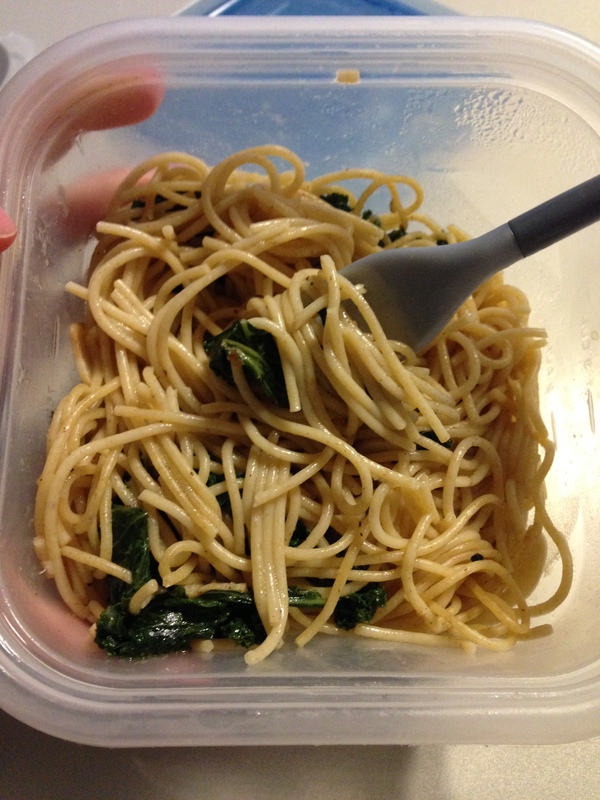 Everyday Food has a bad habit of including recipes for pasta dishes that don’t really have a sauce, they just have some ingredients to top the pasta and some directions about using reserved pasta water and the residue from other ingredients to “coat the pasta.” These recipes are almost always disappointing. These two were prime examples. 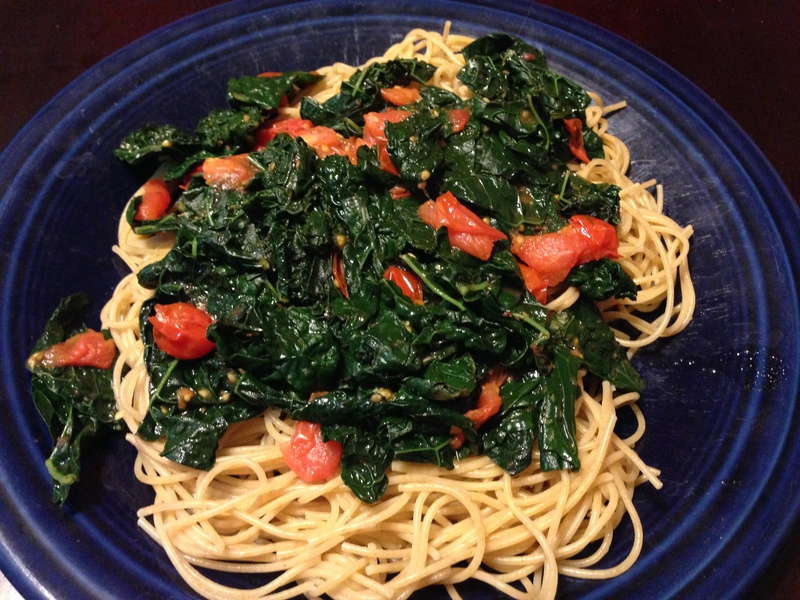 Take the whole-wheat pasta with kale and fontina. It has bacon and garlic in it. It’s got kale. It’s got cheese. Okee doke, right? Eh, not really. 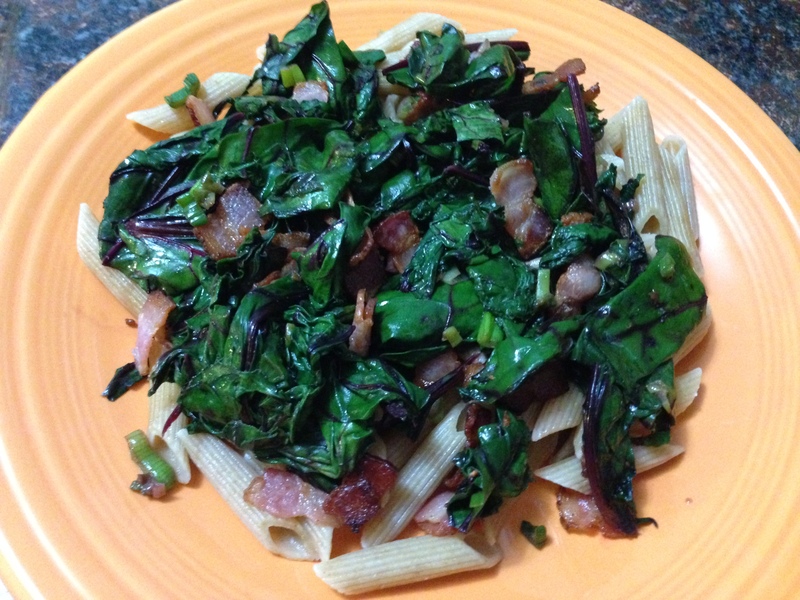 The kale, bacon, and cheese kind of clumped together, so those bites where you got those were amazing, but all of the other bites were just a mouthful of wet noodles. Not great. I did appreciate that this recipe used chicken broth instead of water. That definitely gave it more flavor than the “add reserved pasta water” recipes. And it gets points for bacon. This one gets a B-. 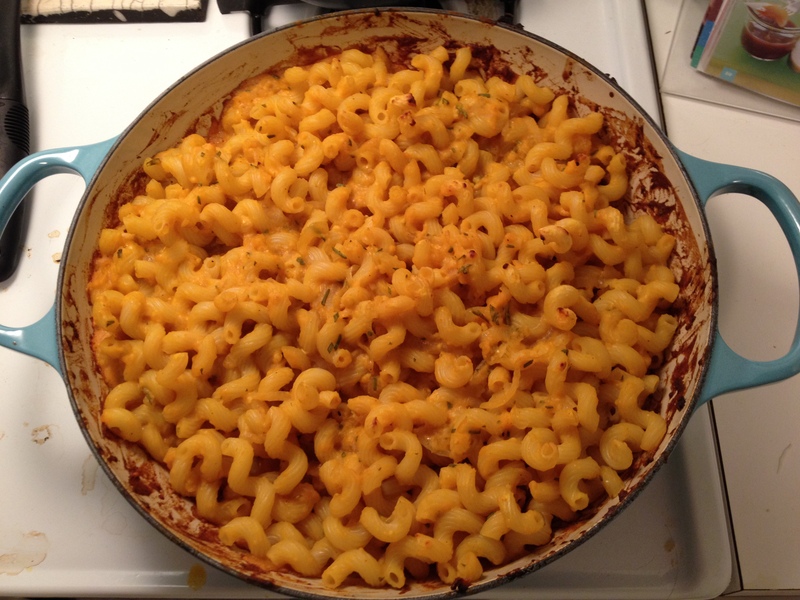 Before I move on, I should mention that this recipe was made so D could carbo-load for the marathon. Go D! Run run go fast! The tortellini in broth with escarole gets a C. It too uses chicken broth instead of water and, again, that’s a good thing. But it is otherwise just a glorified soup. 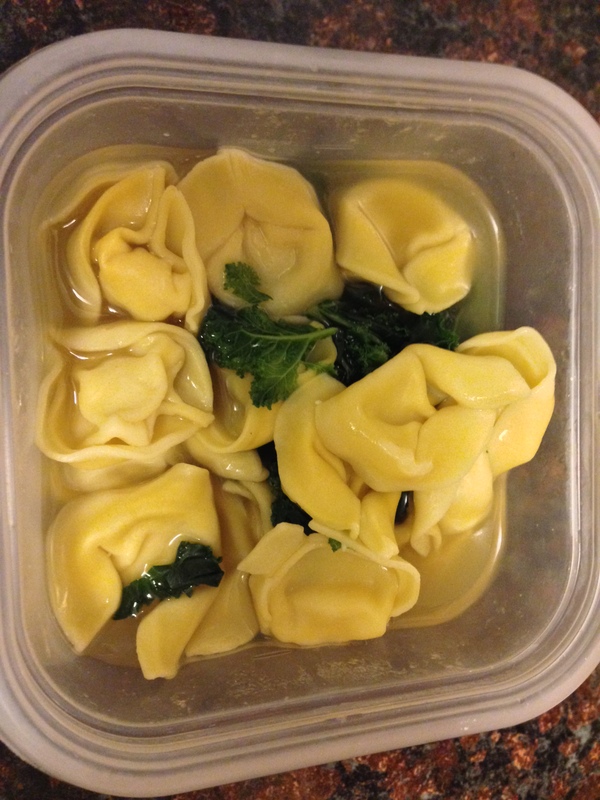 Broth and bay leaf, escarole (I could only find kale), and cheese tortellini. It’s not bad. It’s just average. First of all, this recipe made me realize that I either have not done much cooking with fresh rosemary (I swear I have used it before but I don’t remember it ever being so fragrant!) or else the rosemary I’ve been cooking with has just been really under par. My kitchen smelled like Christmas from the instant I started chopping that rosemary. It was so fragrant that I was a little nervous that if I used the amount stated in the recipe it would totally overpower the dish. I took a leap of faith and threw it all in. It was not a mistake. It tasted so lovely with the caramelized onions and parmesan. It was really comforting but at the same time I didn’t feel bad about going for seconds because it wasn’t overly cheesy or fattening. I made just a couple of adjustments from the recipe. I used cavatappi pasta because I love it’s twirly-ness (I did this with the Mac and Three Cheeses last month too). I also didn’t bother with the bread crumbs on top. The dish was good enough on its own so it really didn’t need it. If I had been serving it for guests I might have used the crumbs because they do make it look a little more fancy. I would definitely recommend this dish to everyone! So good and hearty!